Martin Mowforth (MM): Good, recording. So, firstly, the 9th of July 2014. 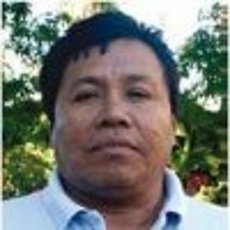 A short interview with Geodisio Castillo, to update me on Panamanian matters referring to the environment. Firstly, Geodisio, thank you for the interview. The first question is, I remember in our last interview you said that the Guna General Congress was experiencing difficulties with the administration of Kuna Yala – so I am asking if there have been any changes in the last five years, and if the Congress is still having difficulties. Geodisio Castillo (GC): Well, nothing much has happened since you interviewed me in 2009, until this year when there has been a change, a first exchange of Caciques [a lot of noise, unintelligible]. Now they have just had two and a half months, between May and July, to have taken control: Cacique Guayaquile Feder of the Nargana sector: Cacique Belisario López from the sector number 3 from beyond Dubwala: and Cacique, which had already changed, but is new: the Cacique from the Alligandi sector is, I don’t remember the name now. MM: No, the name doesn’t matter, I understand. GC: Well, it happens. But the same structure hasn’t changed much, lately they were in discussion two months ago – the two new Caciques [bosses] were requesting information about their employees, their programmes and co-ordinators. Because these two last new ones who came in had seen there might be problems. So, yes, they wanted to change the structure a little or the communications between the officials, which really didn’t exist inside Congress. Concerning Congress matters, responsible officials didn’t exist. We have an institute of research and development, the SIGLA, but it is a powerless structure. It has a board but it doesn’t have an executive director. In my time I was the executive director, but I’ve left now. Since then they don’t have one, so it’s a problem. Programmes were stopped and some projects were stopped and they didn’t know how to carry on. This is the current situation, which really is a problem and needs to be resolved now. We hope they can do so soon. MM: OK, thank you. I imagine that tourism is still growing in Kuna Yala, in the Kuna Islands. Is that right? GC: Tourism in Yala is growing massively, it’s booming, as they say, but the standards Congress asked for are not being applied – they’re being lost. There aren’t any supervisory people who really apply the standards. The communities are also involved because they have economic interests in tourism. So, it’s not clear who is in charge. So, standards exist but no-one is complying with them. There’s no real control. Tourism is coming in from everywhere, by land, sea and air. MM: I understand. Belonging to foreigners too? GC: Foreigners are coming in by land, sea and air, they’re coming. There is no control, Congress appears to be concerned solely with itself, as people in the last Congress say, they seem to be concerned just with the office of Congress, just gathering dust and not reacting. It’s really a problem [unintelligible, both talking at once]. What’s more tourism is going to bring, and we are sure of this, it’s going to bring an environmental problem. Because each island is small. The carrying capacity for tourism has not been studied. There was a plan to study it but it was never implemented. And it was noted that in one island, for example Icon [? ], which is the closest to the coast down the road from here, one weekend it was inundated with people, well I took a photo, too many people. It’s a big problem of tourism. MM: OK, moving away from tourism, to another issue, something you mentioned to me the last time was climate change, and I think you were working on a programme about climate change in or at least referring to Kuna Yala. Could you tell me a little more about your work in climate change? GC: Yes, lately the communities are conscious that these things are going to change, that the climate is going to cause islands to flood, polar caps [to melt]. Because we have had many talks, a lot of dialogue with organisations. There are small programmes that Congress has, but it has rejected some. I don’t know why. For example, Congress has a programme right now, with Massachusetts MIT, the Institute of Massachusetts. Is it the Institute of Massachusetts? MM: Yes, the Massachusetts Institute of Technology, yes. GC: They have a programme about recycling, which reduces the impact of climate change. And there are communities like Carti which already have a plan to transfer it to their own community, on the mainland. There’s another community, in the Claudio Chico [?] sector, which already has [the programme], but from which, when this project started, they had barely cleaned up land which will separate [a lot of noise, unintelligible]. The government has said before that they would support it; but I don’t know if they are going to support it, I don’t know. But our work was more educational. I believe it was the basis for re-assessing knowledge. And recently, what we are doing with this question is trying to make it understandable, also within the framework of climate change, especially about the damage which is being done to the reefs. We have a conservation programme for lobsters – we’ll send you a copy of this. MM: Yes, it would be very interesting. GC: It has been the common fight, but Congress has a programme, but are afraid to accept it. It has opportunities to do it but does nothing that’s what is really happening. MM: Could you get funding from ENCA, the Environmental Network for Central America? We aren’t rich and we are not powerful and our funds are very low, but, for example, recently we have granted funds of $1,500 to a Salvadoran organisation. Others, for example $1000 to another grassroots organisation in Nicaragua. In the past we have made numerous grants, scholarships, all small, but we’re always willing to receive requests of this type. Normally with our funding we can distribute donations between $200 and $2000, depending on funds. They are always small. GC: I think we will look for that, as someone said, small is beautiful. GC: That’s right. Because the Kuna Yala region has had permission for large projects which haven’t been successful. GC: They haven’t been successful. MM: I believe it’s one of the conclusions of the book ‘The Violence of Development’. So, OK, it’s something for the future, maybe for you. Another question was about the invasion of the Kuna Yala territory. Do you still have problems and difficulties with settlers causing deforestation? GC: Well, the border problem continues but not like before. Yes, there has been some control of the southern border, but there is always invasion. Because what happens is the Congress, I should say the office of the Congress, does not do follow-up on the patrolling of borders. So the settlers know already if they were coming today, or in one or two days and … [unintelligible, two talking at once]. And after they enter, and they want to remove them, there is always someone who says they are not going to come in and then leave; recently, but not like before, because they know that if they enter with the police there, they are going to be removed. The main problem is on the borders of Santa Isabel in the province of Colón on the Caribbean. This problem is historical, because according to our history, Kuna Yala extended further. Except for the Republic, the division of provinces was not allowed, it is a historic claim, but there are always problems, that is, more meetings, or whatever. We have also talked with you about opportunities, that there is an opportunity, that there would be an opportunity in time to have been able to fix this with a buffer zone, but that the community, maybe did not receive the message well. We did not understand it, we did not want it. Also it’s a political division, it’s not going to be possible to extend the territory politically, but, as an environmental area it is possible. Like any area, with a protected area there is a chance to review and extend it, probably not politically. I think it will be something. But then, because the communities understand a little, a little green, it’s not clear – they want this division but want it as a political division. MM: OK. In England we hear about the problems experienced by the Ngobe, maybe the Naso too, referring to the big projects like mining in Barro Blanco and hydroelectricity, Chan 75, for example. But, does Kuna Yala also have problems with the invasion of this type of project, mining, for example, or loggers, or hydroelectric businesses? GC: Well, Kuna Yala has been capable of controlling all this. These projects, you see, in principle all these projects, government or non-governmental, have to approach the General Assembly of Congress to get its permission. Projects are discussed in two or three Congresses, and they refuse most of these types of project: mining, hydroelectricity and logging. They have all been completely rejected. However, that doesn’t mean that they don’t jump the border, furtively, secretly; as explained before, there are patrols but where they can enter, they take gold, cut a bit of wood, hunt animals, but there is some control, but not much. The government knows not to start a project in Kuna Yala. GC: It’s not, for example, a big project that we want. If they had listened, Congress rejected REDD, the famous REDD Plus. GC: A private business that has experience in Kenya, if I’m not mistaken, that is managed well; Congress accepts, in principle, that it will present the proposal. Almost a year of Congress to completion, there are enough, enough …. MM: Do you have information about this? GC: I could tell you about it! MM: Good. Could you send it to me, if you have a summary or a report or something? GC: No, I have the report, the last report presented to Congress, the document which was rejected. MM: Yes, it would be very useful. Yes, thank you very much; yes, especially to see the focus on REDD. GC: Our idea was that we work to make a small report and put it in the public eye, but we have not been able to do it because we don’t have a contract to support it from any public organisation, somone who can give that support. But the document is there, we were asked for it, we sent it, many are interested, and there are the documents. But I’ll send it to you, don’t worry. MM: Good, and just one last thing. The development of organic agriculture and CENDAH, the organisation called CENDAH. Can you update me on developments, if there have been developments? GC: Yes, in the last three years, we have done a lot of work with the administrative communities of Nargana. I am not of the idea to extend the whole comarca, because there isn’t any money. We work with various Nargana communities, and also the community of Niadup (the heart of Jesus), Akuanasutupu, and we work with the people of Molaquedup. Mandiala, Carti. Mandiala is a community found in Canga, these are two forgotten communities. Everyone there is always interested in developing traditional themes including agroecology. The problem lies in getting the prodct out, and there are always people in the community who think they must commercialise everything. We say little by little, it’s a [?]. Within this framework there is a lot of support for the programmes of the Mesoamerican Biological Corridor, as they are. We help, we facilitate these programmes too, as projects. But what happens is that the Government does not have technicians. That’s the problem here. You have to live there, and afterwards no-one follows up and it’s forgotten – that was the problem. In our case, we involved two communities, three specific communities: Cangandi, Mandillala and Nargana – everybody has an experience gained there. We have plots of land in Nargana, banana plots; in Mandillala we have plots of pineapple combined with rice, and in Cangandi we have plots combining cocoa and plantains, which are maintained but there have to be some people to provide the follow-up. I think it’s almost two months since I’ve been there, but they always say to me:no, all is well, we are still eating. MM: Yes, but the problem is to keep the product fresh. GC: Now, there is going to be a problem, for me, a problem. Not long ago, the American-owned CocoaWell business. GC: There was an agreement with the [Kuna] Congress about cocoa production. MM: OK, cocoa what? Could you write that for me? Cocoa Well. GC: CocoaWell is the name of the business. MM: OK, good, thank you. GC: It’s a North American company, it has a web page. They had an agreement, and they are providing monthly support with 1500, 1200 photos, images of cocoa; within the agreement they have to donate 3% of what they make internationally, that’s about 75,000 dollars, to the Congress, in order to begin work in the production of cocoa. But what happens? Congress has the problem that the institute has failed to advance for the last three years. Until now they have not appointed a technician, they can’t agree about the level of investigation. As I said, that’s the project and we suggest that if things don’t get better we will have problems. They are going to be putting money in because they want to work with the clones. As they already have in Bruja (? ), Bolivia. So the Tropical Agricultural Centre (CATIE) of Costa Rica [two talking at once, unintelligible] were working with me on soil analysis and monitoring the water and the state of the cocoa. They recommended cloning (GM), the only form of improving production, because it is the best way. In general as CENDAH we have been part of all this, although our part is small. MM: OK, that’s the end of my questions, but do you have other things for me here to bring me up to date with Panama themes and developments? Maybe, one more question: are you expecting any changes from the change of Government – from the current Government? GC: Well, I hope there will be changes, even though I doubt it. And, if we are talking about the indigenous peoples, worse; because I am convinced that the governments which get to power don’t take into account indigenous peoples in these changes. They are political and more of our people have become politicized. I mean when there is a change in Government, for example the QRD [unintelligible, a lot of noise in the background] that says that it was revolutionary at the time, to name an executive at the level of xxxx [unintelligible – a lot of noise]. This, after never having appointed an official, it has always been an unknown politician. The previous Government changed the director of the ANAM (National Environment Authority) who was a military man, an ex-military man, a policeman who did nothing. MM: That’s the head of ANAM, isn’t it? GC: Eh, of Culallales (?) I’m talking about him, no, Emilio [unintelligible, both talking at once]. GC: So, currently as the Government has not appointed capable people at the national level they still haven’t appointed anyone. There hasn’t been, we are waiting for someone to be appointed, but the politicians are disputing the post. So nothing changes. MM: Yes, more of the same. GC: Yes, but at the national level it’s happening, they’re appointing people who have already been, like ministers in previous Governments in the same guise, even though they might put on new faces – it’s the same face. MM: Yes. One more thing, You remember the Ngobe protests, two or three years ago? Were they supported by Kuna? GC: Yes, the Kuna have always supported the protests and this problem still continues, in mining and hydroelectricity. The problem continues and the Government still says nothing about it. MM: So there is still solidarity between the indigenous peoples? GC: Yes, but Congress has already left the National Coordinating Body of Indigenous Peoples (COONAPIP); it has left, is no longer a member. COONAPIP now has no say, they aren’t present there; it’s a coordinator with no teeth. They left because of the problem with REDD, the townships were in agreement with them leaving. MM: And this is governmental, a government coordinating body? GC: It’s not governmental, it’s a bringing together of the indigenous townships, an administrative division of municipalities. GC: It’s an entity which is the political entity which should guide us, but there are internal conflicts too. Like the programme REDD, some want it, but, as I’ve already said, others don’t, and they left. MM: OK, interesting. So, thank you very much. GC: Also, I might add finally, something about the famous Plan for the Integrated Development of the Indigenous Peoples. This arose at the level of the United Nations – it’s a policy of the United Nations, and three years ago, yes 3 years, we made a development plan, in our view, from our position. But the Government has said that it must be integral, only one integral document. It’s a problem because each culture has its different vision and how it wants to develop. So, this is what we have been talking about lately, because the last Government did not approve. This Government wants to approve it, because it is going to create a Ministry for Indigenous Affairs. Everyone talks to the Ministry and the people ask ‘Why is there a ministry?’ ‘What is the purpose of the Ministry for Indigenous Affairs?’ So this plan is going to be problematic, it’s going to be the strategy, but it must be discussed further. Each culture, each community has its own identity. So that’s the latest thing, and this weekend there is a meeting, the first meeting and I don’t know if I’m going to be invited. My friends told me about it but nobody has called me. OK, Geodisio, thank you very much again. I hope we are going to meet every five years. I’m sorry it can’t be more frequently, but it depends on my visits to the Central American countries. But it is always very, very interesting for me, and I like to hear and listen to your perspectives. It’s important not only for me to understand but also others, for the readers of ENCA newsletters, for example. Thank you very much. I am very grateful. GC: You’re welcome. A little observation for you. When, in this work, there is always something difficult to understand in the Kuna dialect, for example, when you are reading, there are some little words, but it’s no big deal. If there are other interviews, if there is something you don’t understand, ask me, so I can ..
MM: Yes, so add your email address. MM: Yes, thanks very much. And, can I have your permission to include this on the web page? MM: Perfect. Thank you, thank you. Well, that’s the end. One year after this interview, ENCA provided $900 (USD) of funds to CENDAH for a programme of monitoring and education about the lobster catch in Kuna Yala.